Dental pulpal tissue removed using a barbed broach. With the advancement of pulpal regenerative therapies, we have come to appreciate and respect the healing capacity of the pulp. While MTA and new bioceramic materials are allowing us to create better coronal seals, we now have new treatment options to replace the traditional apexification and apexigenesis procedures. 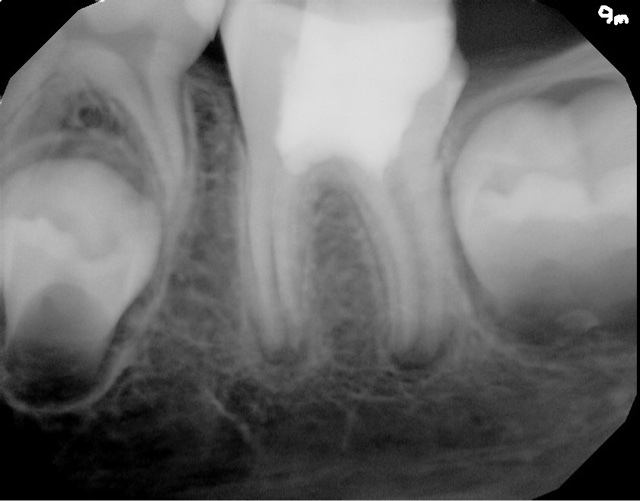 While pulpal regenerative procedures were first applied to necrotic immature teeth, usually affected by trauma, this has led to the development of new vital pulp therapies on carious, immature teeth. The following case demonstrates a MTA pulpotomy on a vital, healthy pulp with carious exposure. 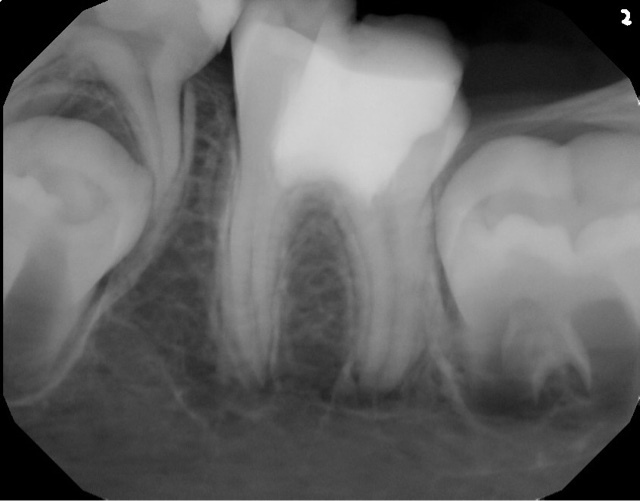 This 8 yr old presented in 2012 with deep caries on an immature #19. The pulp tested vital, but his dentist expected pulpal exposure. He was also reporting night time pain, which typically is associated with irreversible pulpitis. Caries removed, pulp chamber cleaned out, MTA placed against the amputated pulp tissue, with resin restoration. 9 month re-eval finds the tooth a symptomatic and functional. Apices continue to develop normally. 2 year recall reveals a symptomatic tooth with full function. Roots have continued to develop to normal length and thickness. Coronal protection recommended. 3 year recall finds tooth a symptomatic and functional. Root development is complete and appears normal. While previous apexigenesis procedure have been used to keep the pulp alive in order to complete root development, these new materials seem to give a better prognosis and are an exciting advance in the development of vital pulp therapies. Now you are probably wondering what that title means? As we all know, posterior teeth often get craze lines (surface cracks) in the enamel due to truama, large restorations, heavy occlusion or parafunctional habits. When these craze lines go past the enamel and into the dentin, we refer to them as cracks. Coronal cracks are very common in adult teeth. Seeing a coronal crack in a tooth should prompt you to question the occlusal forces, parafunctional habits, size the existing restoration, the vitality of the tooth and then the need for coronal coverage. This patient came to our office in early 2010. She was reporting throbbing pain to temperature that had been bothering her for a couple of weeks. She also reporting biting pain. Diagnostics found #3 was normal to cold test, normal to probing, mild pain to percussion, pain to biting pressure. 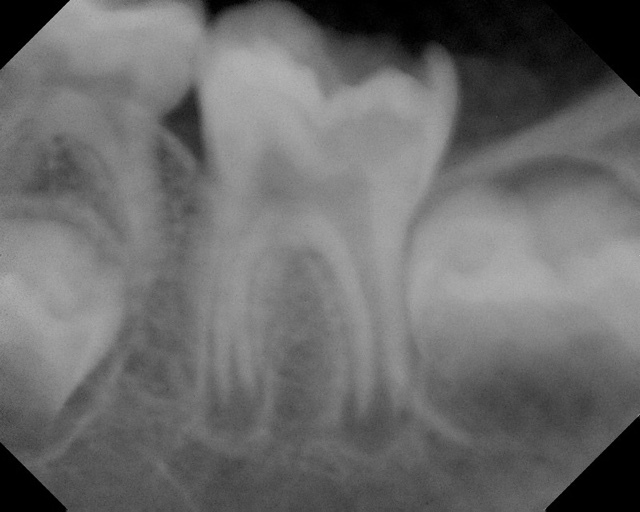 DX; #3 reversible pulpitis with symptomatic apical periodontitis and cracked tooth syndrome. 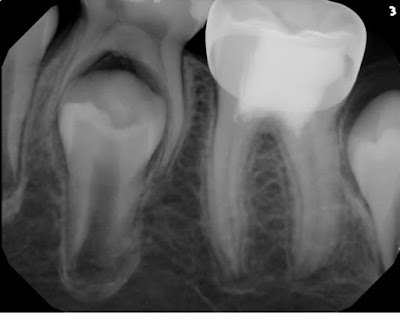 We decided to treat endodontically before a crown would be placed. Upon accessing the pulp, we found a stained crack on the mesial and smaller crack on the distal. Pt was informed that these cracks would not be completely removed, and would affect the long term prognosis for the tooth. The patient, understanding that the prognosis is guarded, elected to preserve the tooth as long as possible by completing the RCT and placing a crown. RCT was completed and returned to GP for coronal coverage. 5 year recall of the tooth finds it fully functional and asymptomatic. Note the fine margins of the crown which play a key role in the success of this treatment. 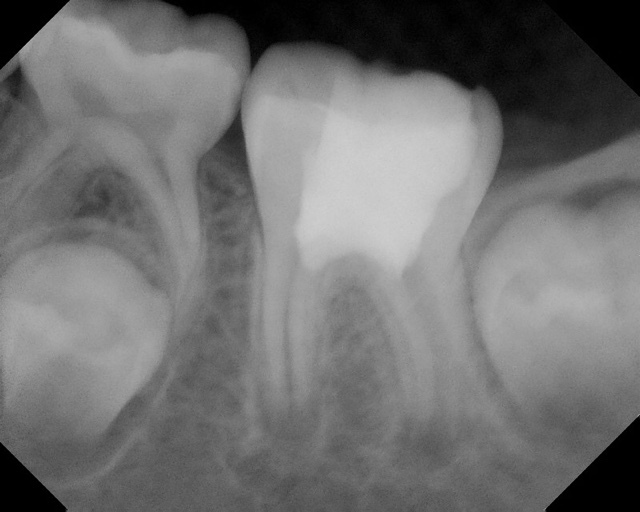 Some patients will elect to retain a natural tooth with a crack, understanding the guarded long term prognosis, rather than extract and replace it immediately. 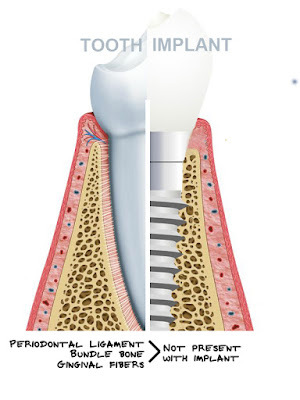 In previous posts, we have discussed the differences between implants and root canal therapy. We have made the argument, which is still seen playing out in many of our dental journals, that implants and root canals are not really alternative treatments. If a tooth is restorable (no root fracture, stable periodontium) then maintaining the the natural tooth is the ideal treatment. At Superstition Springs Endodontics, we work with the best dentists in the east valley, who understand and help their patients understand the value of the natural tooth. However, many patients get information from other sources that give them the impression that implants are just like teeth, but never get cavities, periodontal disease or any of the other challenges we have in maintaining our natural teeth. This view is not the whole story and doesn't help patients understand the unique challenges that implants have. Those who propagate the idea that implants are a better and hassle-free version of natural teeth will use implant research to argue that an implant is more successful than traditional restorative dentistry. Many patients and some dentists are convinced that dental implants are without complication and have unlimited lifespan. It is not until recently that we have begun to see articles addressing the "Failure of Dental Implants" (JADA Aug 2014, p.835-842.) Terms such as "ailing" implants and "reimplantation" are new on the scene. However, an article in the Journal of Clinical Periodontology by Cairo et. al. reviewed the quality of reporting of randomized clinical trials in implant dentistry from 1989 - 2011. Their systematic review found that the implant trials were mainly parallel trials, single center trials. While these methodological flaws affected the reporting of these studies, they also noted that the quality of these studies only partially improved over time. They found that allocation concealment was at a high risk of bias, there was a lack of reporting characteristics of drop-outs, and lack of CONSORT adherence. The authors concluded that with these methodological flaws, and failure to adhere to CONSORT, the statistically significant results reported in this body of implant studies, caution is suggested in data interpretation and generalization of outcomes. It is also noted that many of the methodological flaws seen in implant research are also found in endodontic research, dental research in general, and all throughout medicine as well. However, we should expect and demand that the quality of the research published and used to make treatment recommendations should be improving over time. Greenstein, G. Cavallaro, John. "Failed Dental Implants: Diagnosis, Removal and Survival of Reimplantations" JADA 2014. 145(8), 835-842. Cairo, F., Sanz, I., Matesanz, P., Nieri, M., Pagliaro, U. "Quality of Reporting of Randomized Clinical Trials In Implant Dentistry. A Systematic Review on Critical Aspects in Design, Outcome Assessment and Clinical Relevance" J. Clin Periodontol 2012. 39(Suppl. 12), 81-107. CMS has delayed the enforcement of the new Medicare rule until June 1, 2016. The deadline for enrollment has been moved back to Jan 1, 2016. For more information from ADA, click here. UPDATE! Medicare Enrollment: Opt In or Opt Out? Recent changes in some of the rules regarding Medicare will now affect dentists more than they previously have. Thanks to a recent visit with Aaron Fisher of HealthChoice, we learned a few things about these changes effective June 1, 2015. However, Medicare will begin offering supplemental dental insurance to Medicare participants through 3rd party insurance companies. These are known as Medicare Advantage Plans. In other words, Medicare is offering private dental insurance through private dental insurance companies. Here's the catch... The federal government gets to set the fee schedule. So if you want to participate in the the medicare advantage plans, through any given provider, you have to be willing to take the federal fee schedule. So before you sign up for the Medicare Advantage Plans, you need to review the fee schedule, as you would any other dental PPO fee schedule, and decide if it makes business sense to work at the discounted fee schedule. If you are in Arizona, the easiest way to describe these plans would be "AHCCCS for Medicare Patients". The fee schedule would be the same as the AHCCCS fee schedule. A quick example of some commonly billed codes on the AHCCCS fee schedule. For a full fee schedule, click here. The ADA Benefit Plan Analyzer may be a useful tool in helping you decide what impact Medicare participation, as well as any other PPO, will have on your practice. click here. So if you decide to participate in the Medicare Advantage Plans, you will be agreeing to this fee schedule like any other PPO that you would sign up for. There may be some benefits with some of these plans. 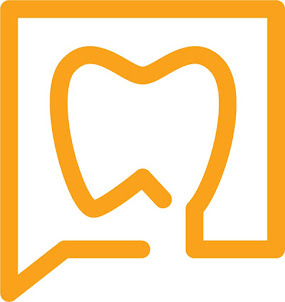 Since these plans are administered by a 3rd party, they may have less paperwork than you would expect from a government program, less pre-authorization needed and may have higher benefit levels than the typical $1000-$1500 benefit level of most dental benefit plans. If you order or refer covered clinical laboratory services (biopsies), imaging services, or DMEPOS (apnea devices) for Medicare patients you will need to either enroll in Medicare or formally "opt out" of Medicare. For more information, click here. As of Dec. 1, 2015, Medicare will require all physicians, including dentists, who prescribe Part D covered drugs to their patients to either be enrolled in Medicare OR must "opt out" of Medicare, in order for their patient's prescriptions to be covered by Part D.
Doctors who "opt out" of Medicare are required to have written contracts with the Medicare beneficiary stating that the doctor and the patient have forfeited the right to bill Medicare, and the patient is essentially paying a "fee for service" out of their own pocket. The doctor must also submit an affidavit to Medicare expressing their desire to "opt out" of the Medicare program. This "opt out" affidavit is for a period of 2 years. So while all dentists are free to participate in Medicare, there are new compliance issues if you choose not to participate. Dentists who want to be able to order lab services (biopsy), imaging services or DMEPOS (apnea appliances) covered by Medicare need to enroll with shortened form CMS-855O. 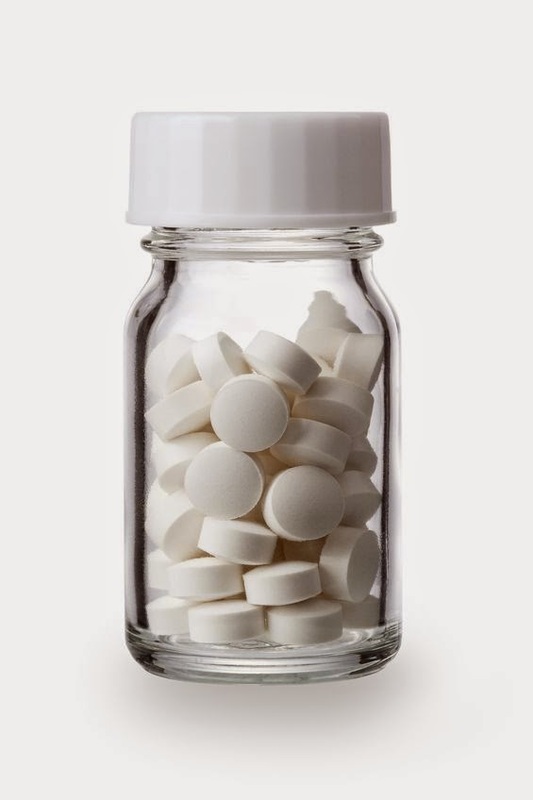 Dentists who want to are not Medicare providers, but want their patient's prescriptions to be covered by Medicare Part D, can also use for CMS-855O. Sending Medicare an affidavit stating they are not participating in the Medicare program - you have 90 days to change your mind - otherwise there is a 2 yr waiting period before you can sign up. This "opt-out" option will expire after 2 yrs and will need to be done again. Signing contracts with Medicare patients stating that both parties forfeit the right to bill Medicare - essentially agreeing to pay a "fee for service"
Dentists who "opt out" of Medicare DO NOT need a contract with the patient for them to recieve their Medicare Part D prescriptions. Contracts with patients are only needed when you are providing other services that would normally be covered by Medicare. Dentists who do not want to participate in any Medicare services, but still wish for their patient's prescriptions to be filled by their Medicare Part D need to formally "opt out" by sending Medicare the affidavit. Dentists who do not provide any Medicare services, who do not order or refer Medicare services (lab, imaging, DMEPOS) and who do not need Medicare Part D to cover the prescriptions they write for their patients do not need to enroll or "opt out"
The deadline for dentists to "opt in" or "opt out" of Medicare is June 1, 2015. Those dentists who don't take any action will not likely see many changes this year, but eventually will begin to get calls from the pharmacy or patients complaining that the medications they have prescribed to their patients are not covered by Medicare Part D. According to the ADA, complying with this law will save you time and aggravation. 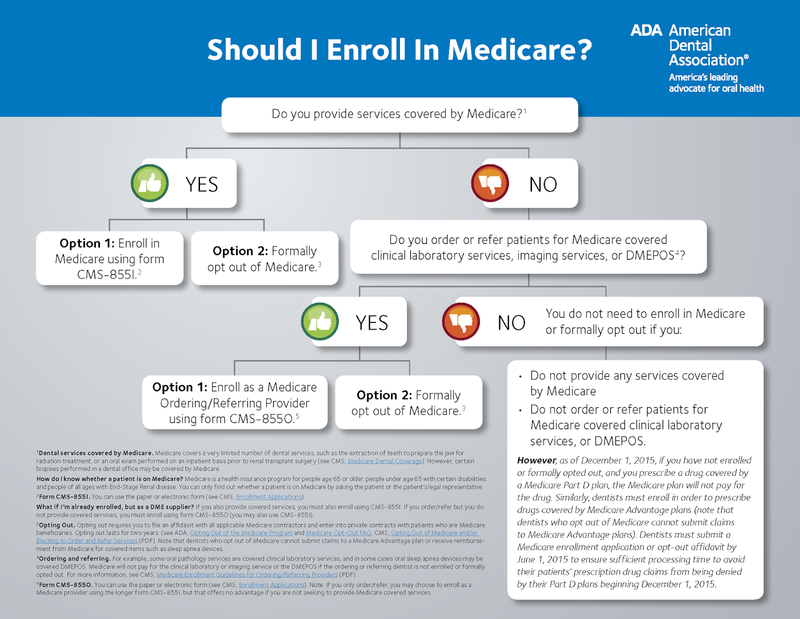 The following infographic, published by ADA, will help you decide whether to "opt in" or "opt out" of Medicare. For more information from the ADA News, click here. This patient came to our office in 2012. She reported trauma in the early 1970's - when one of her kids accidentally head butted those teeth. They became infected and a RCT was done in the early 70's. Original crowns still in place. Her dentists ever since have pointed out the radiolucency, but for the most part is has been mostly asymptomatic. Our exam finds #24 and #25 with mild percussion sensitivity, normal probings and class II+ mobility. 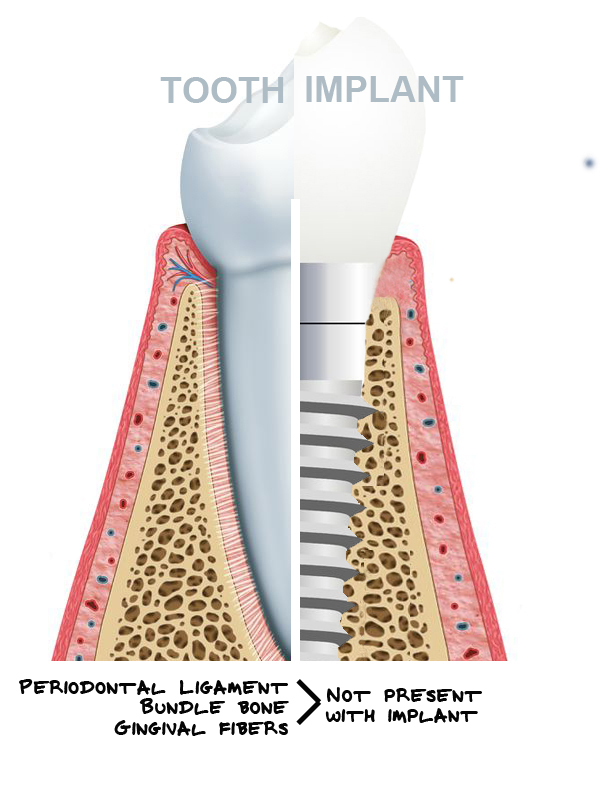 We discussed the resorption that appears to have affected the apex of #25. We discussed options and she wanted to try to retain the tooth, so we decided to attempt an apicoectomy with guarded prognosis. PreOp #24 and #25 - RCT done about 40 years earlier. Because of the resorption at the apex of #25, a traditional root end preparation and filling was not possible with removing too much tooth structure. In this case, we bonded Geristore on the root apex and tried to "cap" the apex. Retrofill #24 is MTA. At one week, the patient reported some pain and throbbing following the treatment with increased mobility. We stabilized the teeth with some bonded resin and recommended Augmentin. At two weeks, patient reported improvement, but gingival inflammation was present and #25 had a class III mobility. Teeth were removed from occlusion to remove any occlusal trauma. We recommended a second antibiotic at that time, Clindamycin. At three weeks post op, area is feeling better, inflammation/infection has resolved, tissue looks improved and both teeth are class II mobile. From this point, the patient has remained asymptomatic and we have seen full resolution of PARL. This is a tooth that would be extracted by most dentist, and by many endodontists, however, apical surgery is too often overlooked as a treatment option. 2 Year Recall - complete bony healing. We should not forget how lucky we are to work in a biologic enviroment that is so forgiving and with such ability to regenerate bone.